Rollin.io is a cryptocurrency-based Bitcoin dice game. Simple, instant, and anonymous are some of the words that can best describe this Bitcoin gambling site. With a competitive house edge that varies from 0.6% to 1%, players will have the freedom to dictate their gameplay with respect to the amount of winnings they target. I had the chance to speak with its co-founder, Kiran, who is responsible for the marketing, finance, and customer support of the brand, talked about the early beginnings of Rollin.io and the realistic plans he and his team have for their business. Can you tell me how you came up with Rollin.io? We came up with the idea to start a Bitcoin lottery, so we did some research about the Bitcoin gambling market. We came across some bitcoin dice sites and we loved the features that allowed players to choose their own winning odds or multipliers, and to place fast bets. We loved the low house edge, the fast transactions, and the vivid Bitcoin gambling community. This was also the first time we heard about provably fair gaming and we liked the concept behind it. That was the beginning of Rollin. How long did it take before you actually launched this website? We took 3 months to build the website from scratch. Before we started working on Rollin.io, we had a Bitcoin exchange website where we were selling Bitcoins. Unfortunately, we were very unlucky with our first Bitcoin startup and lost money to a scam. We had to put our website on hold, to wait for a new KYC (know your customer) policy for selling Bitcoins online in our country. So we were looking for another, interim Bitcoin project. You co-founded Rollin.io. Who else is on board? Our co-founder Ivan did the design and programming from scratch. He is very talented, as you can see. Our newest team member, Michel, worked on the backend or admin control page of Rollin. How do you think it stands out from the other Bitcoin gambling sites? We love to compete with other Bitcoin gambling sites; it keeps us alert and innovative. Our mission is to build a gambling platform that is transparent, social, simple to use and fun to play. Our Bitcoin dice game is written in HTML 5 and can be played in any HTML 5-compatible browser with no download required. That said, it is not yet mobile friendly. Because the majority of our users play via their PC or laptop, our priority has been to focus initially on those platforms, making them more user friendly and so giving the majority of our players the best gambling experience that we can. Since your brand’s debut, what are the challenges you experience? It’s not easy for a casino, especially a Bitcoin casino, to build up trust. Playing at a Bitcoin casino can be risky because the lack of regulation means if a casino runs off with players’ money, there is almost no chance of getting it back. Most of these casinos intended to scam players from the beginning, therefore only gamble with money what you can afford to lose; even if it’s a trusted gambling website, you can never be 100% sure the casino will not scam you. 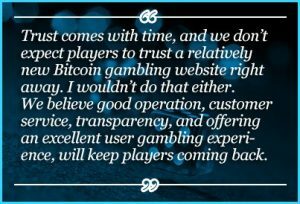 Trust comes with time, and we don’t expect players to trust a relatively new Bitcoin gambling website right away. I wouldn’t do that either. We believe good operation, customer service, transparency, and offering an excellent user gambling experience, will keep players coming back. Indeed. How do you intend to improve Rollin.io’s image or services in the months to come? We’re running several marketing campaigns to share our amazing gambling platform. We also plan to add a few more features to our Bitcoin dice game. Eventually we will add more games to our platform, but that is at least several months out. Finally, we will keep innovating to stay competitive and to become a serious player in the Bitcoin gambling market/environment. What would you wish to tell your new and old customer abou t your business? Our bankroll is self-funded, although we have not ruled out accepting public investment in the future. With outside investment, we could have a larger bankroll, making possible higher maximum bets—and therefore higher payouts—for players. We would also be able to share the profits of Rollin that way. When we are able to take this step, we will make a public announcement. Before we close this, Kiran, can you share your thoughts on the rise of Bitcoin as well as that of casino and gambling sites? Bitcoin, the first cryptocurrency, is one of the greatest tech inventions of the past decade. Imagine a world where the money supply isn’t in hands of banks/governments, who can steal your wealth through the hidden hand of inflation, but in the hands of people; a truly free market, wouldn’t that be great? Money was originally invented by people and emerged from the free market. Though many details still need to be worked out to improve security and the user experience for mass adoption, Bitcoin has the potential to make our financial system much more sustainable. It deserves the space and support to really reach that potential. Bitcoin gambling opens up a lot of opportunity for players and has many advantages compared to traditional gambling. For instance: provably fair gaming, fast payment processing, anonymity for players, most Bitcoin gambling sites have low house edges between 1% and 2%, low transaction fees, fast bet placement, and micro betting. Lastly, how much will cryptocurrency impact our lives in the months or years to come? Cryptocurrency is revolutionary. It has changed the way we are doing transactions; it’s fast, transparent, has low fees, and no boundaries. The interest in Bitcoin is growing day by day. It’s already possible to buy just about anything you can think of with Bitcoin. 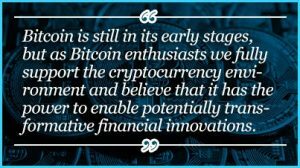 Bitcoin is still in its early stages, but as Bitcoin enthusiasts we fully support the cryptocurrency environment and believe that it has the power to enable potentially transformative financial innovations. Wonderful. Thank you and it’s a great pleasure having this.